Microblading Eyebrows creates a fuller, natural eye brow. It’s a semi- permanent, cosmetic tattoo. The blade is made up of a row of needles, which are dipped in ink and placed in the skin with hair like strokes to create a natural brow on the eye brow line. Where is Microblading available in Waterloo? As of 2018, NV Beauty Boutique will be offering mobile microblading appointments in Waterloo. Prior to the appointment, please ensure all pets are put away. A designated sink and a room without carpet must be available for the beauty specialist to properly proceed with the appointment. Typically, microblading eyebrows lasts 1-3 years. Touch up appointments are usually required for best results. How do I prepare for a Microblading appointment? Don’t drink alcohol or have any aspiring the night before the appointment. Also, avoid waxing and plucking your brows before the appointment. Over the next several days as the tattoos start to dry, apply the ointment given to you by the beauty specialists. Avoid drinking alcohol, heavy sweating, tanning, and scratching the brow. 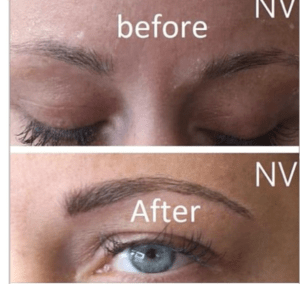 Why choose NV Beauty boutique for Microblading? NV Beauty Boutique Specialists provide Microblading in our Beauty Boutique location, as well as our convenient mobile service appointments. Our in- home microblading appointments are a travel- free way to accommodate your microblading appointment in your own home. Since Microblading is breaking the skin, sterolising equipment is extremely important. There is risk of transmitting infectious diseases such as HIV, hepatitis B and C, and skin infections. Microblading might also cause allergic reactions to inks and scarring from repeated tattooing.